DETAILS:Stamped .925, Will fit up to a 7" wrist - One side latches through the Knot, Opens for easy on and off. 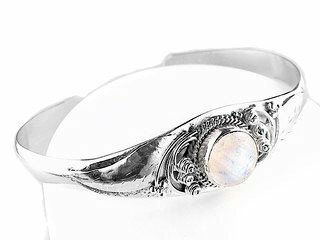 A Gorgeous Sterling Silver Filigree Butterfly / Dragonfly Cuff Bracelet with Open Wings.Bracelet has an inside Circumference of 7.25" with a 1" Gap (will fit a 7.5" to 9" wrist) , is 2" wide at its widest point, weighs approximately 21grams, and is crafted of genuine .925 sterling silver. 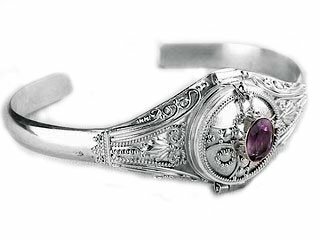 A Gorgeous Sterling Cuff Bracelet with a Celtic Cross and a Genuine (8x6mm) Amethyst Gemstone (Light to Medium in Color).This is a Sterling Silver Poison Cuff Bracelet that Opens! 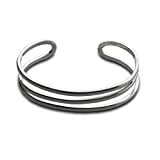 Bracelet has an inside Circumference of 6.5 Inches with a 1" Gap that can be easily adjusted to fit almost any size wrist. 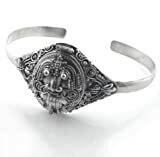 The Bracelet is 1" Wide, weighs 23grams, and is crafted of genuine .925 sterling silver. 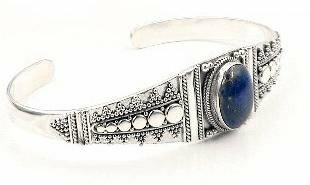 This Unique Sterling Silver Cuff Bracelet has a Stylized Ornate Egyptian Scarab on Top and Opens to Reveal a Secret Compartment approximately 3/4" wide, 7/8" long, and 3/16" deep. 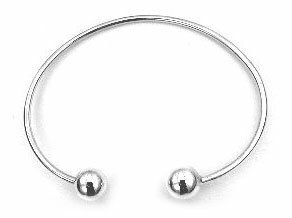 Bracelet has an inside Circumference of 6.5" from end to endwith a 1" Gap that can be Adjusted to Fit Most Average to Large Size Wrists (approximately 7.5" to 9 inches). 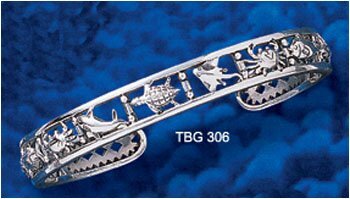 The Bracelet is 1.25" Wide in the Center, Weighs Approximately 24grams, and is Marked .925. 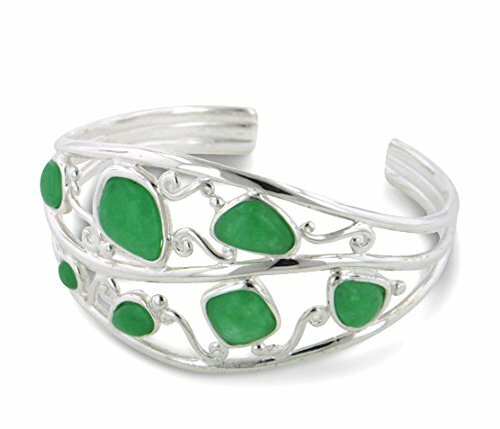 Bangles are as easy to wear as they are fashionable. The sleek lines of the bangle draws attention to the polished sterling silver heart. Rotate the heart and you have a beautiful turquoise heart. Also available as a matching ring. Each Eclipse piece comes packed in a beautiful jewelry pouch, great for gift giving! 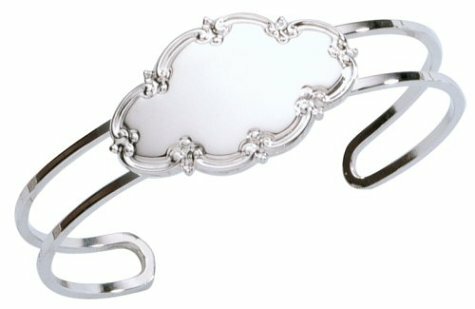 2 BRACELETS IN 1 - Transforms with the slightest touch! 12. Bracelet, 'Cushion' 6.3" Inner Circ. 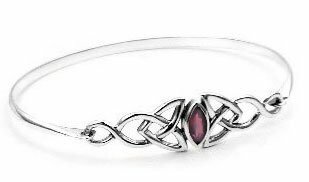 Triple twists of sterling silver make for a great Ôevery day, everywhereÕ bracelet. 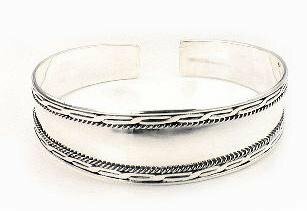 Native American handmade.